Ever since data has existed, dealers have used it to target relevant audiences with their ads. Now, thanks to social media, there’s more consumer data at the individual level than ever before. This article will show you how you can unlock the hidden secret of Facebook ads for car dealers and make the ultimate connection with your customers. Microtargeting is a marketing strategy that uses consumer data to identify individuals or small groups of like-minded individuals and influences their thoughts or actions. It works much like traditional demographic and geographic targeting, except that it works at the individual, or “micro,” level. Microtargeting first hit the advertising scene in Presidential races, when political candidates went beyond standard party-oriented messages and suddenly were talking to voters (mostly on social media) about specific topics that resonated with them. It sounds basic, but consider the difference between a Republican candidate who shows members of both political parties an ad about protecting gun rights, versus a candidate who shows that same ad only to registered Republicans who are concealed carry permit holders and have expressed interest in organizations like the National Association of Gun Rights. The second candidate’s ad is obviously going to be met with more support! The candidate is using what they already know about that individual to connect with them on shared interests. The awesome (and kind of scary) part? Facebook has data (like who has an interest in pro-gun rights organizations) and MUCH more on its active users. That means that the power of microtargeting isn’t just for Presidential candidates anymore. Facebook ads for car dealers have come a long way! Now, your dealership can also use Facebook’s consumer data to identify individuals and make your message connect with them on a deeper level. While it’s important to start with Facebook’s automotive targeting and reach In-Market Car Shoppers and Owners through Facebook’s advertising platform, Facebook’s auto data is just the tip of the iceberg when considering all of the other customer data available to you. In order to actually get users to stop and connect with your vehicle ad in their Newsfeed, you need to pull in something else: emotional microtargeting. 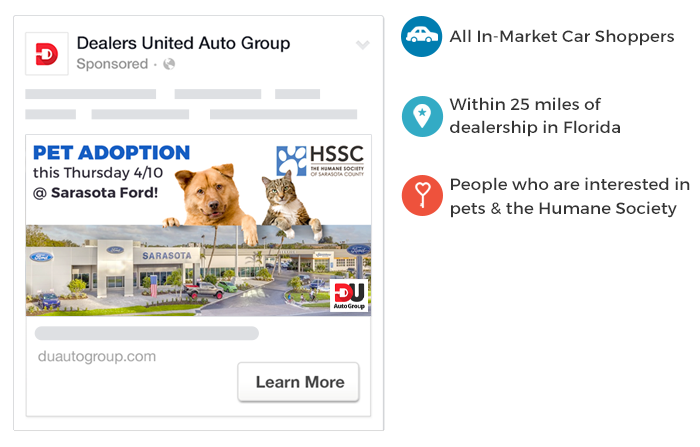 Together, these 3 components will help you create a super-specific ad that speaks directly to your customers and takes your dealership’s Facebook advertising to the next level. Remember: Your ads’s creative and data targeting need to work together! If you’re going to microtarget a specific audience, your ad creative should be unique enough to attract their attention in the Newsfeed. Using our Microtargeting Equation, we created some examples to show you how you can create a Facebook ad that truly resonates with your customers. Note how every aspect of the ad creative, from the imagery to the vehicle to the text, was chosen to reflect the ad’s data targeting and really “speak” to the audience. Would it benefit you to blast your community with a commercial talking about your $500 military savings? Maybe. But what if you could microtarget only In-Market Car Shoppers who are also active military and veterans with your Military promotion? There wouldn’t be a wasted advertising dollar in site! Case and point, Lugoff Ford. For just $1.16 per click, Lugoff Ford drove 376 In-Market Shoppers to their website by advertising their Military promotions specifically to interested active Military or Veterans. …and unique impressions. Remember, you’re significantly narrowing your audience to target more relevant customers. But better quality traffic to your site. Quality > quantity! Because you’re targeting a smaller audience, you’re working harder to reach those select few awesome customers! Remember, these possible tradeoffs are worth engaging the right customer at the right time, with the right message that speaks directly to them. If you become a pro at microtargeting and are able to connect your brand to the interests of individuals in your community, you will capture their attention, sell more vehicles, and create a relationship with your customers for years to come. So make sure you or your Facebook Advertising vendor are going beyond basic targeting and are paying attention to the small details—they’re what counts in today’s fast paced Newsfeed!